As the first of four blog posts showing how you can use Showbie Groups, we’ll look into using it as a tool beyond classroom walls at conferences and special events. 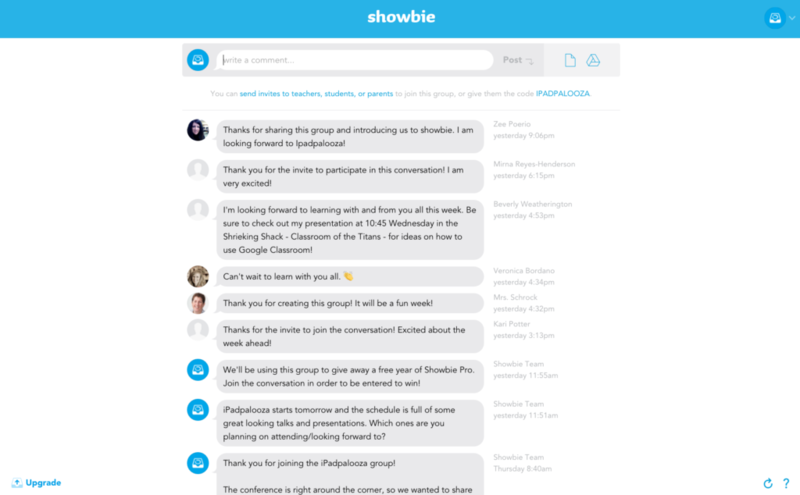 Edtech conferences iPadpalooza and ISTE are here, and we wanted to share how Showbie Groups are a powerful tool to connect at these conferences, as well as any upcoming event! Probably the most obvious reason for joining an event group is to stay up to date on the latest news there. This is especially helpful for people who can only make part of the event, or even for those who can’t make it at all. For example, when Showbie went to Bett earlier this year in the UK, many teachers expressed wanting to know what was happening at the conference because they weren’t able to make it. We didn’t have Showbie Groups at the time, but it would have been the perfect place to keep everyone connected. If you’ll be attending and presenting at either ISTE 2016 or iPadpalooza, feel free to join our respective groups and start promoting! An event group is a great way for you to get an inside look at what conference attendees are saying and posting so that you can find out more about all of the moments you missed! Many teachers attending events like iPadpalooza and ISTE have presentations or special events they want to promote. Showbie groups are a great place to alert others about when and where your presentations are taking place. Staying in the loop at conferences and events is great, but being able to share resources with educators you may not have had any connection with before is even better. Many teachers attend conferences from all around the world, so joining a group network is a great way to make connections and meet others with the same passions and interests in edtech and beyond. It’s also a great way to start a resource sharing network, since Groups allows you to upload files and more. Want to Win a Pizza Party for Your School? If you haven’t already, we encourage you to join our Showbie pizza party contest group! Simply share your idea for using Showbie groups with us, and you could win a $250 GC for the restaurant of your choice for your entire classroom! We’ll be giving away three prizes at the end of June, July and August.